The famous Rodgers and Hammerstein musical “The Sound of Music,” besides being highly entertaining, offers a number of practical lessons for homeschool music lessons. As a brass and piano instructor, I continue to rely on the Julie Andrews “Maria” character for inspiration on how to effectively teach music to students. In one memorable scene, Maria teaches the Von Trapp children how to sing the notes of a major scale using a mnemonic technique. The oft-repeated song “Do-Re-Mi” blends music appreciation and music theory through a catchy tune that even the youngest musicians can understand. Parents who may not have musical experience can still incorporate the song into their home school lesson plans. The structure and lyrics (“Doe, a deer, a female deer; ray, a drop of golden sun…”) use puns, rhymes and associated hand signs to help students memorize music notation. In my private lessons, I use similar strategies to teach music to children as young as four years old. 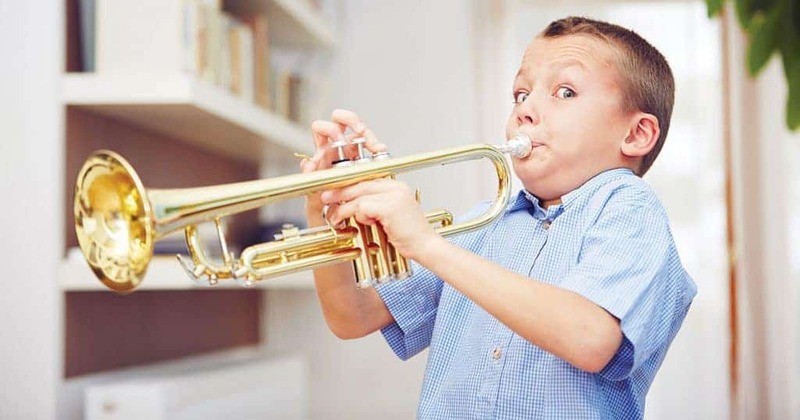 Here are three homeschool music exercises that parents can use to enrich their students’ extracurricular education through music. Each of these exercises teaches music theory principles and reinforces core subjects such as reading, spelling, mathematics and science. These exercises are suitable for all age levels, listed in order of increasing complexity. In “The Sound of Music,” Maria shows the Von Trapp children that everyone can understand a simple melody or rhyme. Similarly, I help students read sheet music by writing various note patterns on a staff—either bass or treble clef depending on the instrument—and have them spell out the words. Each note is represented by a different letter (A, B, C, D, E, F, G), which can be combined to create words such as BAG, FEED, FADE, or GAFF. My students enjoy discovering “hidden” words in the sheet music and making patterns of their own. Once the students spell out the words, I have them play the notes so they can hear the melody. This reinforces their sight-reading skills as well as their spelling and creativity. For younger students, I also use dollar bills to represent whole notes and quarters for quarter notes. More advanced students combine sets of notes to practice counting measures of music, which always have a set number of beats depending on the key signature. I have found that students who practice mathematical exercises associated with counting beats are often better at sight-reading rhythmic patterns. Many of us made guitars out of shoeboxes and rubber bands when we were children. This is a cheap and effective way to teach sound waves. Plus, students can actually see the rubber bands moving as they make a sound. Older students learning physics can refine this experiment by creating complex instruments. A simple tuner allows students to create their own Do-Re-Mi scale with any instrument. Inexpensive apps for iPhone or Android include Cleartune ($3.99) and Tuna Pitch ($2.99). Guitars, as well as panpipes or flutes, are popular instrument choices because they are easy to make. I also recently made a working trombone from copper tubing and electrical tape purchased at Home Depot. Students who follow a similar process of building their own instrument have even more fun playing it. Well before I learned to play the euphonium—a large brass instrument closely related to the tuba—I fell in love with music by watching the “The Sound of Music.” Next family movie night, jumpstart your kids’ love of music with this classic musical. Then, incorporate music principles into your home school lesson plans.